I may not be a medical professional, but I am able to tell when I encounter descriptions of body motion that just make plain sense, and this DVD contains some enlightening information. In a collection of well narrated chapters complete with diagrammatic video illustration, the evidence is laid bare of our common tendencies to keep our bodies out of balance, causing pain through muscle tensions that, in turn, keep our bodies in bad posture. This is due in part to us having mapped the body in a particular way, eg in relation to position, when in reality the position is entirely different. This DVD is broken into multiple sections covering the many aspects of posture imbalance, and covers areas from the head to the feet and just about everywhere in between. Posture is translated by the authors as ‘Body Maps’ which are essentially memories in your mind of where you think your individual body parts are and how you use them. The DVD highlights how you may have had a flawed map (understanding) of your various body parts in your mind from a very young age. This may have led you to actually move according to those flaws and results in the straining of some parts of your body which can lead to pain. As the narrator tells us, “We move in the way in which we think we are constructed …”, either consciously or unconsciously. Wrong body maps can be responsible for many bad posture related problems, from walking to sitting, to using a computer. The areas I can relate to most pertain to the shoulders, arms, wrists and hands. These are covered in detail and are very applicable to the RSI sufferer. The main posture/skeletal issues with RSI type injuries are listed, adding to the viewer’s knowledge and understanding through plain and straightforward explanations along with clear diagrams and video. From previous experience, I knew that over-supination of the wrists was a bad thing, but now I know about the natural axis of rotation of the forearm and how it ties in with a neutral position wrist, as well as why supination causes so many injuries. The company website rather generously shows sample videos of some chapters which are well worth checking out, and will give you a sneak peak of the DVD content and style as well as some key body map information! I also found the section on breathing very interesting. It’s probably the first time I’ve been able to picture the role of the diaphragm in breathing, and I certainly had my lungs mapped as being a bit lower than they actually are. The related section on the ribcage was also revealing to me having just recently strained my sternum connective tissue whilst gardening. It also reinforces the benefits of some breathing practices including Yogic breathing (Pranayama). The DVD run time is a substantial 2hrs, and certainly lends itself to being watched in stages. There is the temptation to skip straight to the section you are most interested in, however it should be watched as a whole to get the complete picture and overall message firmly ingrained in your mind. I expect that multiple viewings would be best to fully absorb the detail. All in all this DVD is an excellent resource for just about everyone. 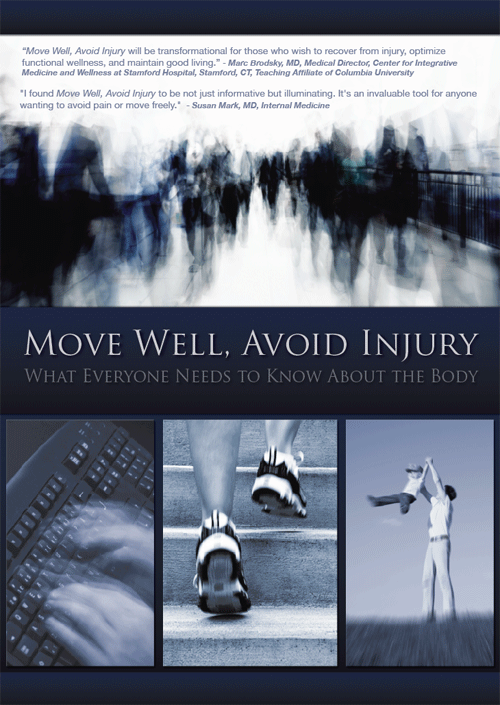 It is not solely aimed at one specific group of people eg RSI sufferers, but covers the whole body, and should be a useful education tool for everyone, including ergonomists, physiotherapists, fitness instructors, yoga teachers etc, as well as many others including in the medical profession. If you have posture related pain it’s likely that it’s down to your bad body map and it’s certainly time to re-educate yourself! I have also watched this DVD and find it to be fascinating, wonderfully educational and potentially life-changing for those who apply the valuable information so clearly presented.I plan to watch it over and over again!! to email them and ask. « Microsoft “Natal” technology – the dawn of a new age in ergonomics?